Joe Eissing, 2nd vice president of our Office of General Services Local, center, is congratulated on receiving our State Mission Achievement Award by Capital Region President Ron Briggs, left, and CSEA Executive Vice President Mary E. Sullivan, right. ALBANY — Joe Eissing knows the best way to meet challenges from anti-labor groups is to stay union, stay strong. That’s why he’s working hard to build our union, including at his own workplace, where his efforts at one-on-one conversations with members really connected them with our union. For his extra efforts in union building, Eissing was recognized with our 2018 State Mission Achievement Award presented at CSEA’s 108th Annual Delegates Meeting. In this December 2018 photo, Motor Vehicle Local President Cindy Stiles, far left, and Office of General Services Local 2nd Vice President Joe Eissing, second from right, distribute CSEA fliers and decals to union members in the Empire State Plaza concourse. Through his interactions with new employees and nonmembers at the state Office of General Services, Eissing dramatically reduced the number of nonmembers at the agency. Eissing, a motor vehicle operator who serves as 2nd vice president of our Office of General Services Local, said he “made it a mission” to reach out to workers to provide that critical introduction to our union not only by orienting Office of General Services employees new to state service, but by reaching out to longtime employees who were both full CSEA members and nonmembers. “It really surprised me that most [workers]didn’t even realize that they were not already full members,” said Eissing. 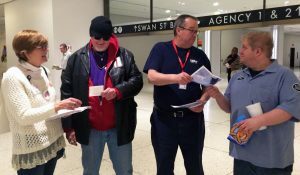 In addition to one-on-one conversations, Eissing organized several lunch & learn sessions so members could learn the benefits and resources available to them as union members, but also to share the facts about how anti-union groups, elected leaders and corporate interests are trying to destroy unions.